This post comes from our friends at LawDepot, an online resource that provides expert advice on thorny legal topics. This particular piece reviewed various forms of rent payment with a simple conclusion- choose one and keep it. We couldn’t agree more. In an increasingly paperless world, accepting and making rental payments online is the safest, most efficient remedy. For record keeping, for fraud prevention, speed of receipt, and accuracy. Working with your tenants to find the right mode is the key to success and one few platforms afford. Rent is the very foundation of your investment as a landlord. Without it, your rental property earns you no income to pay the mortgage. Unfortunately, collecting rent can be a challenge for most landlords. Even with having a solid lease agreement in place, and specifying fees for late rent, some tenants still have issues making their payments on time. So how do you strike a balance that is fair to both parties, ensuring, you, the landlord, gets paid, and the tenant is able to easily give you the rent on, or before, the first of every month? Let’s look at the ways tenants pay rent, and the advantages and disadvantages to each payment method. A check is a secure form of payment that tells the bank to pay money from the check holder’s account to another party. Checks are still accepted by many landlords. Advantages: Checks can be mailed in advance, and can be postdated to cash on that date. Disadvantages: If the check bounces, the tenant gets charged a bank fee. And of course, receiving a check does not guarantee that the tenant has the money in their account. Note that checks are not as common among millennials—something to keep in mind if you are renting to the student market. Accepting rent by cash is not recommended as it’s easy to lose, hard to trace, and there may be discrepancies on how much the tenant paid you versus how much you received. Another disadvantage of cash is that each month, you will need to meet with the tenant for collection. If you do accept rent by cash, which is not uncommon for landlords who rent out their basements or live nearby, always provide your tenant with a receipt to acknowledge they have paid, and provide a record of them doing so. Tenants may prefer to pay by cash as a lot of people use it to keep track of how much they are spending. 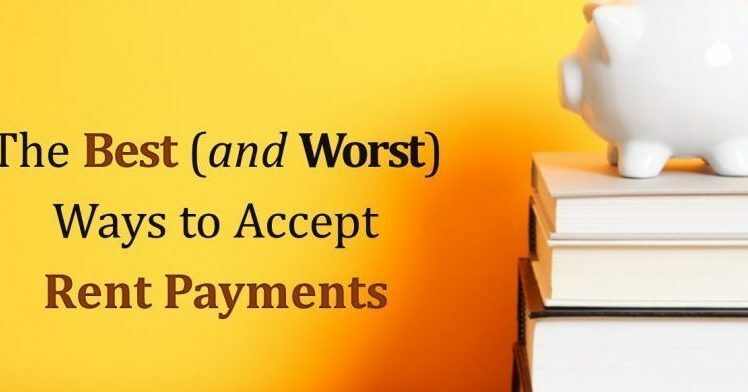 However, it doesn’t show up on their bank statement as anything more than a withdrawal, which is why it can be tough to attribute to a rent payment. Cashier’s checks/bank drafts are are a secure form of payment, where the bank withdrawals on its own funds, only after they’ve withdrawn the money from the account holder’s account. While secure, these types of payments can be unrealistic for most tenants, as it usually requires a fee to draw one up and the tenant needs to go to their bank to issue one. Money orders, like cashier’s checks, are another secure form of payment based on prepaid funds issued by banks, post offices, drug stores, or grocery stores. However, while money orders may be good for one-time payments, they aren’t necessarily realistic for long term rent payments, as they require the tenant to go out month after month and get one. Email transfer, or direct deposits, are becoming increasingly common among landlords for the ease and convenience of collecting rent payments almost instantly. This type of transfer is advantageous from both party’s perspectives because most people have Internet and conduct banking online. Plus, there is the added bonus of digital records that leave you with an e-paper trail should there ever be any doubt about when you got paid. Possible disadvantages may include a small fee for the transfer, although this is usually less compared to other forms, and if a tenant is away, or does not have Internet access, you may not get paid until they are able to access their online account. Similar to email transfers, PayPal is an online method of making payments. To set up a PayPal account, the user simply signs up on the PayPal website and authorizes their bank account to connect to their PayPal account. That way, the tenant moves money from their bank account to their PayPal account, and can then transfer the rent to their landlord for a small fee. With PayPal, both the landlord and tenant must have an account in order for the transfer to work. Some disadvantages to PayPal may be that there are a couple of hoops to jump through, starting with setting up the account, transferring money from the tenant’s bank account into PayPal, then PayPal to their landlord’s PayPal account, and possibly the landlord’s PayPal account into their investment property account. The form of payment you accept as a landlord may seem like a small detail, but it’s a very important one. Your situation, as well as the amount of properties you own and lease, will affect which form of payment is easiest for you to manage. If you own many properties, establishing a single form of payment may be the simplest way to keep track of all the payments coming in. If you are renting out one or two properties, you may be open to accepting various payment forms based on your tenant’s preference. It’s likely if you negotiate a mutually beneficial payment method that satisfies each party, your renter will be more apt to pay on time and in full.